One of the best Croatian Cabernets! This wine comes from fabulous vineyards settled near Poreč. Istrian red soil, flecked with quartz stones, gives a high proportion of minerality. The vines are treated by Organics principles of viticulture. 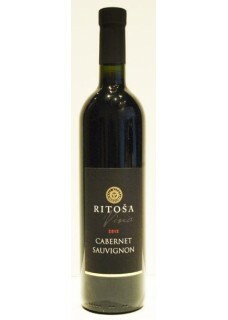 Winemaker Ritoša in vintage 2012 in its new, technologically advanced cellar managed to produce a wine with all the varietal characteristics of Cabernet Sauvignon, floral and fruity aromas with a touch of tobacco and leather. Part of the wine is aged in the finest French barrique, which gives it extra softness and complexity. On the nose is intense, tannins are present and together with respectable body, suggest a strong longevity. The finish is long and floral aromas eventually will deeply impress. Considering the price, it is difficult to find such a wine in Croatia. Food pairing: Game, barbecue and oily fish dishes. Tradition of wine making has been family legacy throughout generations. Wine was produced in the family for centuries, mostly for personal use. In 2007, they started to produce wines for the market. Vili Ritoša planted the vineyard according to the highest standards, invested in the purchase of modern winery equipment, and equipped the cellar with quality wooden barrels and stainless steel tanks that control the temperature of fermentation and wine storage. His Teran and Cabernet Sauvignon express the pure Istrian Terroir of red soil. A very interesting winemaker on the rise!